Practice Area: This course offers a complete practice area and includes a golf academy for instruction. Description: Rock Barn Golf & Spa is located in the foothills of the Blue Ridge Mountains and features 36 holes of award-winning golf. Both courses are extremely picturesque, yet dramatically challenging. 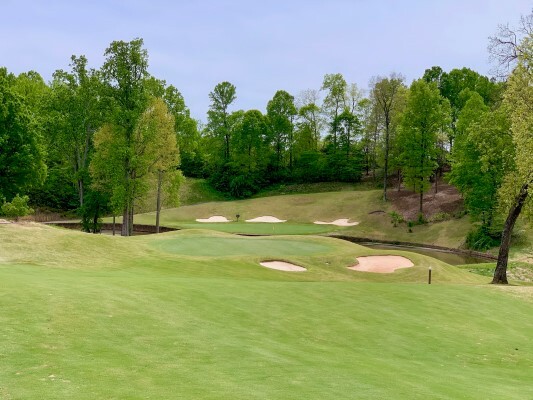 The 18-hole Robert Trent Jones Jr. layout is the more challenging of Rock Barn’s courses and is truly a championship course. It takes full advantage of the terrain as well as Lyle Creek, which meanders throughout the property. The Jones Course was awarded best new Course in the state by North Carolina magazine in 2003. It was also chosen by the PGA as an annual stop for the PGA TOUR’s Champions Tour event the Greater Hickory Classic at Rock Barn. The Tom Jackson Course is the shorter, less demanding of the two award-winning courses, but still offers a challenging game of golf. It features a number of elevation changes, and demands that you put emphasis on positioning the ball in the fairway. This signature course appeals to golfers of all levels and handicaps. Notes: Memberships are available. In addition to world class golf, this semi-private club offers both casual and fine dining, a full-service spa, a fitness center, an outdoor swimming complex, a spacious tennis complex and a variety of real estate opportunities. Golf, dining and spa services are open to the public 7 days a week year-round. B-Man's Take: I've gotten dozens of requests to add this course to the site and so I did. I still need to plan a trip to try it out. I will post a review as soon as I do. 8/22/16 - Msg Board Posting by IM4DHERD titled "Rock Barn Jones Course is now private"